Ballet for Actors | Captivate Action Ltd. The BALLET FOR ACTORS course is an exciting new training experience in Australia, lead by leading ballet teacher and physical practitioner, Kyle Davey. This unique course will explore the bio-mechanics and movement concepts associated with ballet, as can be drawn into work as an actor and physical performer – whether for direct use in physical theatre, movement pieces, character creation or gesture; or simply to gain a greater understanding and range of your body as a performance tool. Each se ssion will introduce you to ballet terminology and a class structure which is designed to slowly and sequentially prepare the body for larger and more dynamic movements. The classes will progress from fundamentals such as posture and alignment and build to complex movement sequences. With the use of imagery, movement intention and expressive interpretation the course will lead you through exploration and development. By the end of the course you can expect to have enhanced your skills in: Balance, Co-ordination, Control Stability, Isolation, Flexibility, Strength, Stamina, Fine motor skills ,Musicality and Artistry. This is a friendly class that will be run with an open but professional atmosphere. There will be an emphasis on the exploration of the individual’s range of motion within the ballet context so it is suitable for all abilities. Our next course will be announced shortly, so keep in touch with the website and social media sites. You can also sign up to our MAILING LIST and hear first about the launch of this and other training opportunities. Kyle trained at Dubbo Ballet Studio, Queensland Dance School of Excellence and The Australian Ballet School. After completing training he achieved a Diploma in Dance (QDSE), Advanced Diploma and the Graeme Murphy Award for Excellence in Contemporary Dance (ABS). Whilst studying in Australia Kyle has worked with the Queensland Ballet, The Australian Ballets Dancers Company Tour and Australian Ballet. 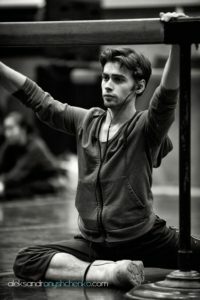 He then moved to England and joined New English Contemporary Ballet where he has performed and created Soloist roles in new and existing productions. Kyle has also danced with Tivoli Ballet in Copenhagen, Cork City Ballet in Ireland and Ballet Russes in Wales. Kyle was one of a handful of dancers employed for a choreographic research project directed by renowned choreographer Wayne McGregor at the Royal Opera House in Covent Garden in 2008 and asked back again in 2009. Kyle then moved to Canada to join Atlantic Ballet Theatre of Canada and created soloist roles for many new ballets in the company’s repertoire which toured nationally and internationally. Kyle has taught ballet and contemporary dance in England, Canada and Australia and is currently completing a Graduate Diploma of Elite Dance Instruction with the Australian Ballet School.